Another pre-NAMM announcement, this time coming from the controller fiends over at Nektar. Best known for their P4 & P6 keyboards which much to our delight have recently gained Cubase support comes something rather different. The Panorama P1 the features generic MIDI controller capabilities that allow operation of any DAW, making this a far more versatile unit whilst still being optimized for both Reason and Cubase usage we fully expect them to extend the template list over time for those not so keen on building their own templates. For those of you who are useing Cubase or Reason then the Panorama P1 will automatically reconfigure depending on whether Mixer, Instrument or Transport mode is selected. The mixer mode provides complete control over the mixer, including EQ, dynamics and sends as well as insert VST plugins in Cubase. The instrument mode instantly provides access to all controllable parameters in VSTi’s or Reason Devices with simple menu structure that enables users to quickly select the area of an instrument they want to work with. Lastly the transport mode delivers a large font readout of song position pointers, left and right locators, tempo as well as critical settings in transport mode allowing thorough song or project navigation control from Panorama. Another key feature is support for setting up macros for use inside your sequencer. Up to 8 keystroke commands can be sent to a DAW at a push of just one button giving you access to DAW functions and menus not normally available via MIDI. QWERTY macros can be assigned to any assignable button including the 11 F-keys which in turn can be stored as one F-key map to any of the 10 F-key map locations. 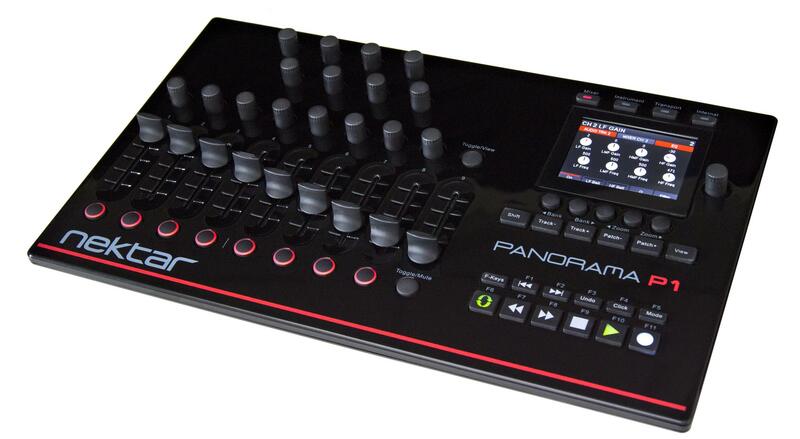 In addition, Panorama P1 also has 20 preset locations for use in Internal mode with each preset storing P1′s controller assignments for generic DAW or MIDI hardware control.